Toddler (Sizes 2-4) - $39.99 Small (Sizes 4-6) - $39.99 Medium (8-10) - $39.99 Large (Sizes 12-14) - $39.99 Only 2 left! Even Batman needs help. Hard to believe, right? 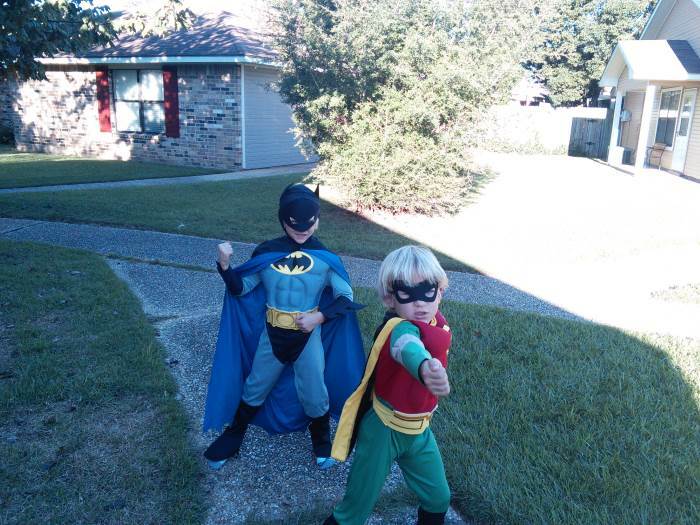 But he doesn't trust just anyone to watch his back, so he turns to his trusty sidekick Robin when the going gets tough. Your little crimefighter can jump into the action with Batman, too, in this Deluxe Robin Costume! Do you know what makes Robin such a great sidekick to the Caped Crusader? Is it how his skills as an acrobat make his jumpy and flippy fighting technique a perfect compliment to the Dark Knight's more punchy and powerful style? Is it how his smaller size makes him better suited for sneaking around and crawling through vents? Does he know exactly how Batman likes his coffee (black as the night, with a bit of lemon to help his growly voice)? It's actually all of that, plus Robin already knows the secret code to get into the Batcave, which really comes in handy in emergencies! 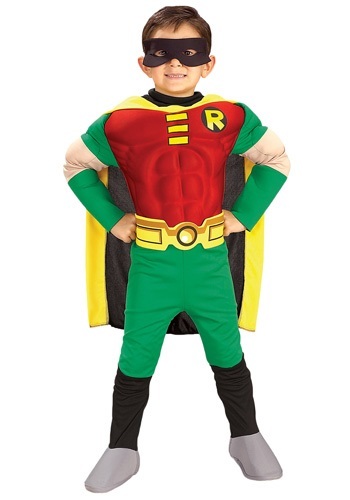 Whether your little one is dressing up on their own, or as a dynamic duo with their brother or dad dressed in a Batman costume, this Robin outfit will get them in the crime fighting mood. They are going to look super-tough with all of the foam muscles built into the top and sleeves of the jumpsuit. The yellow cape features black lining on the inside and velcro fasteners to keep it in place. They may look cute when they put on the black eye mask, but don't let that fool you, they'll also be ready for action! Awesome costume for the price!